I was not a fan of bagels until I went to New York. Daniel and I went to America in May last year for two weeks to have our second honey moon and catch up with one of my besties who moved to NY a couple of years ago. I wasn’t that impressed for the first few days maybe because I didn’t find it that exotic. I am from Seoul originally, a big capital city in South Korea. So going to a big busy city like NY does not really attract me, but Europe does. I made a daily schedule where to visit and where to eat, etc. 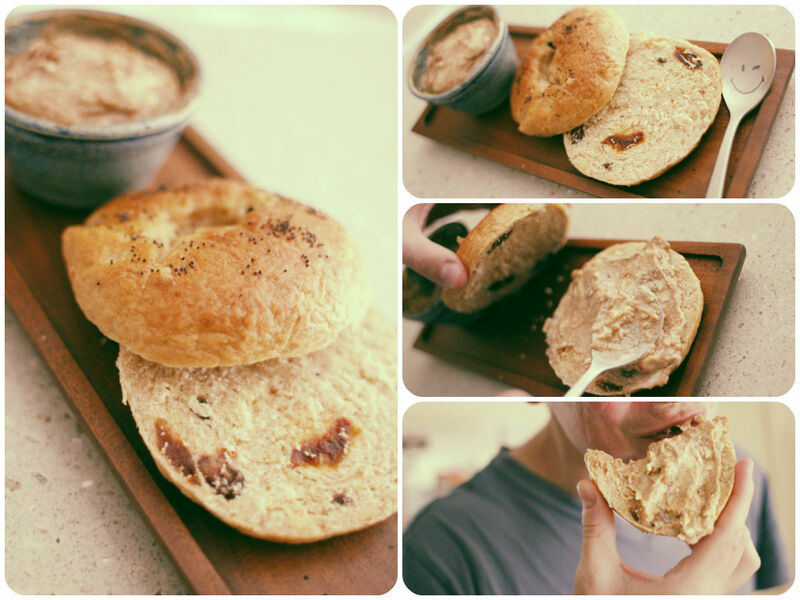 One of the things to try on my list was NY bagels at different places e.g. Ess-a bagels, Murray bagels, H&H Midtown bagels. We walked so much to try to find those bagel places that everyone said nice on the internet. It was okay. Well that didn’t live up to my expectations though and geez rude staff really put me off. Then we were on the way to World’s Trade Centre memorial. We got off the train and started walking just out of the subway station. It started pouring out of blue. We had to get in somewhere to avoid rain, which was “Zucker’s bagels and smoked fish”. Thanks to the rain! I had the best bagel in town, which was a pumpernickel bagel with walnut& cinnamon cream cheese. Fluffy and chewy dark pumpernickel.. generous thick layer of cream cheese inside.. coffee was nice, too. Such a good find 🙂 We were going to go back there though didn’t get a chance. I’ve never been able to find a nice bagel like Zucker’s ever since then. Oh well I will just have to make myself there again to NY. Daniel and I went to this cafe called “Antz in ya pants” near our place on the weekend. We go there almost every weekend to have coffee. Daniel orders their bagels now and then. It looks dense, dry, boring, a paper thin layer of cream cheese…what can I say? So I decided to make some for him this morning and it turned out to be amazing. I will have to try GF version next time so I can have some too. I’m going to serve this with whipped cream cheese with maple syrup and cinnamon powder. Sounds delicious! Mix the starter ingredients in a bowl and leave it covered for an hour. Then you will see all bubbles on the surface – yeast is doing their job! Add the dough ingredients into the starter and mix all together. Knead the dough until smooth. Cover up and allow the dough to double in size in a warm place (on the kitchen bench for me) for a couple of hours. Then punch the dough down gently and divide the dough into three pieces. Roll each piece into a rope and then a circle (the bagel shape). 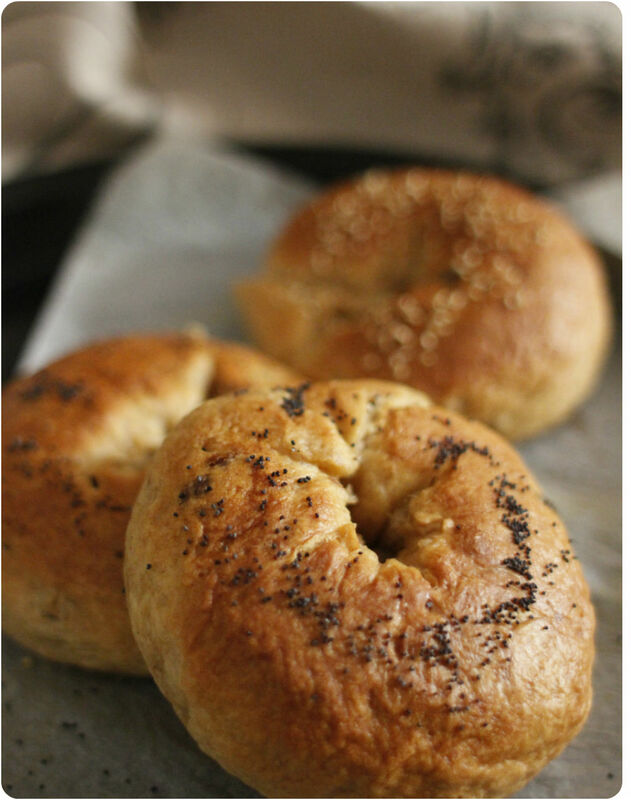 Place the bagels on a baking paper, cover up and let it rise again in a warm place. 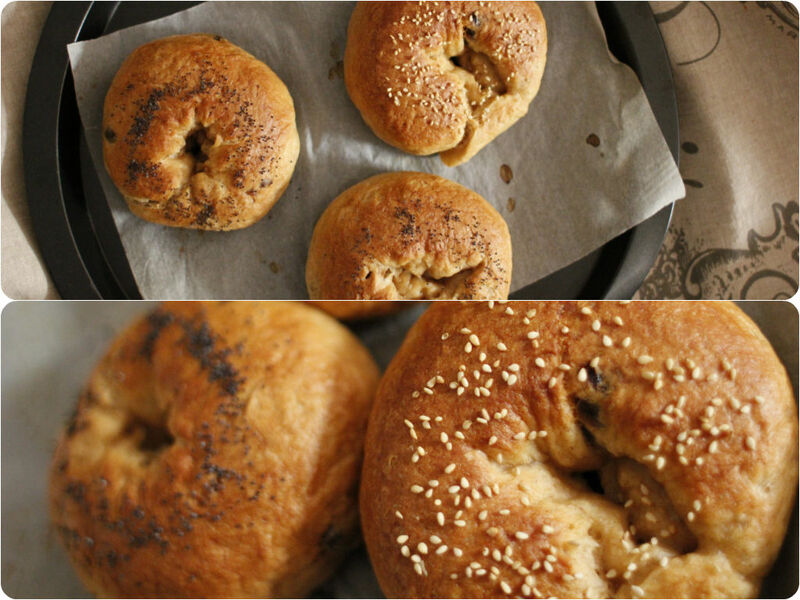 When it’s ready to be baked, put the bagels for a minute each side in a large pan of boiling water with a teaspoon of salt and brown sugar. Pat-dry and place the bagels in a baking pan and bake in the preheated oven (200) for 20-30minutes until they are golden brown.